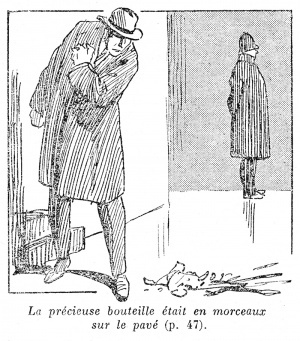 The Curse of Eve is a short story written by Arthur Conan Doyle first published collected in Round the Red Lamp on 23 october 1894 by Methuen & Co., and the same year in USA by D. Appleton & Co..
in La Momie vivante (1923~1924, F. Rouff [FR]) as La Malédiction d'Eve, 1 ill.
Robert Johnson was an essentially commonplace man, with no feature to distinguish him from a million others. He was pale of face, ordinary in looks, neutral in opinions, thirty years of age, and a married man. By trade he was a gentleman's outfitter in the New North Road, and the competition of business squeezed out of him the little character that was left. In his hope of conciliating customers he had become cringing and pliable, until working ever in the same routine from day to day he seemed to have sunk into a soulless machine rather than a man. No great question had ever stirred him. At the end of this snug century, self-contained in his own narrow circle, it seemed impossible that any of the mighty, primitive passions of mankind could ever reach him. Yet birth, and lust, and illness, and death are changeless things, and when one of these harsh facts springs out upon a man at some sudden turn of the path of life, it dashes off for the moment his mask of civilisation and gives a glimpse of the stranger and stronger face below. Johnson's wife was a quiet little woman, with brown hair and gentle ways. His affection for her was the one positive trait in his character. Together they would lay out the shop window every Monday morning, the spotless shirts in their green cardboard boxes below, the neckties above hung in rows over the brass rails, the cheap studs glistening from the white cards at either side, while in the background were the rows of cloth caps and the bank of boxes in which the more valuable hats were screened from the sunlight. She kept the books and sent out the bills. No one but she knew the joys and sorrows which crept into his small life. She had shared his exultations when the gentleman who was going to India had bought ten dozen shirts and an incredible number of collars, and she had been as stricken as he when, after the goods had gone, the bill was returned from the hotel address with the intimation that no such person had lodged there. For five years they had worked, building up the business, thrown together all the more closely because their marriage had been a childless one. Now, however, there were signs that a change was at hand, and that speedily. She was unable to come downstairs, and her mother, Mrs. Peyton, came over from Camberwell to nurse her and to welcome her grandchild. Little qualms of anxiety came over Johnson as his wife's time approached. However, after all, it was a natural process. Other men's wives went through it unharmed, and why should not his? He was himself one of a family of fourteen, and yet his mother was alive and hearty. It was quite the exception for anything to go wrong. And yet in spite of his reasonings the remembrance of his wife's condition was always like a sombre background to all his other thoughts. It was not Robert Johnson's nature to hurry. He was prim and staid and liked to do things in an orderly fashion. It was a quarter of a mile from the corner of the New North Road where his shop stood to the doctor's house in Bridport Place. There were no cabs in sight so he set off upon foot, leaving the lad to mind the shop. At Bridport Place he was told that the doctor had just gone to Harman Street to attend a man in a fit. Johnson started off for Harman Street, losing a little of his primness as he became more anxious. Two full cabs but no empty ones passed him on the way. At Harman Street he learned that the doctor had gone on to a case of measles, fortunately he had left the address—69 Dunstan Road, at the other side of the Regent's Canal. Robert's primness had vanished now as he thought of the women waiting at home, and he began to run as hard as he could down the Kingsland Road. Some way along he sprang into a cab which stood by the curb and drove to Dunstan Road. The doctor had just left, and Robert Johnson felt inclined to sit down upon the steps in despair. Fortunately he had not sent the cab away, and he was soon back at Bridport Place. Dr. Miles had not returned yet, but they were expecting him every instant. Johnson waited, drumming his fingers on his knees, in a high, dim lit room, the air of which was charged with a faint, sickly smell of ether. The furniture was massive, and the books in the shelves were sombre, and a squat black clock ticked mournfully on the mantelpiece. It told him that it was half-past seven, and that he had been gone an hour and a quarter. Whatever would the women think of him! Every time that a distant door slammed he sprang from his chair in a quiver of eagerness. His ears strained to catch the deep notes of the doctor's voice. And then, suddenly, with a gush of joy he heard a quick step outside, and the sharp click of the key in the lock. In an instant he was out in the hall, before the doctor's foot was over the threshold. "If you please, doctor, I've come for you," he cried; "the wife was taken bad at six o'clock." "Let's see! You DID engage me, didn't you?" he asked in no very cordial voice. "Oh, yes, doctor, last November. Johnson the outfitter, you know, in the New North Road." "Yes, yes. It's a bit overdue," said the doctor, glancing at a list of names in a note-book with a very shiny cover. "Well, how is she?" "Ah, of course, it's your first. You'll know more about it next time." "Mrs. Peyton said it was time you were there, sir." "My dear sir, there can be no very pressing hurry in a first case. We shall have an all-night affair, I fancy. You can't get an engine to go without coals, Mr. Johnson, and I have had nothing but a light lunch." "We could have something cooked for you—something hot and a cup of tea." "Thank you, but I fancy my dinner is actually on the table. I can do no good in the earlier stages. Go home and say that I am coming, and I will be round immediately afterwards." "You've taken your time," said his mother-in-law reproachfully, looking down the stairs as he entered. "I couldn't help it!" he gasped. "Is it over?" "Over! She's got to be worse, poor dear, before she can be better. Where's Dr. Miles!" "He's coming after he's had dinner." The old woman was about to make some reply, when, from the half-opened door behind a high whinnying voice cried out for her. She ran back and closed the door, while Johnson, sick at heart, turned into the shop. There he sent the lad home and busied himself frantically in putting up shutters and turning out boxes. When all was closed and finished he seated himself in the parlour behind the shop. But he could not sit still. He rose incessantly to walk a few paces and then fell back into a chair once more. Suddenly the clatter of china fell upon his ear, and he saw the maid pass the door with a cup on a tray and a smoking teapot. "Who is that for, Jane?" he asked. "For the mistress, Mr. Johnson. She says she would fancy it." There was immeasurable consolation to him in that homely cup of tea. It wasn't so very bad after all if his wife could think of such things. So light- hearted was he that he asked for a cup also. He had just finished it when the doctor arrived, with a small black leather bag in his hand. "Well, how is she?" he asked genially. "Oh, she's very much better," said Johnson, with enthusiasm. "Dear me, that's bad!" said the doctor. "Perhaps it will do if I look in on my morning round?" "No, no," cried Johnson, clutching at his thick frieze overcoat. "We are so glad that you have come. And, doctor, please come down soon and let me know what you think about it." The doctor passed upstairs, his firm, heavy steps resounding through the house. Johnson could hear his boots creaking as he walked about the floor above him, and the sound was a consolation to him. It was crisp and decided, the tread of a man who had plenty of self-confidence. Presently, still straining his ears to catch what was going on, he heard the scraping of a chair as it was drawn along the floor, and a moment later he heard the door fly open and someone come rushing downstairs. Johnson sprang up with his hair bristling, thinking that some dreadful thing had occurred, but it was only his mother-in- law, incoherent with excitement and searching for scissors and some tape. She vanished again and Jane passed up the stairs with a pile of newly aired linen. Then, after an interval of silence, Johnson heard the heavy, creaking tread and the doctor came down into the parlour. "That's better," said he, pausing with his hand upon the door. "You look pale, Mr. Johnson." "Oh no, sir, not at all," he answered deprecatingly, mopping his brow with his handkerchief. "There is no immediate cause for alarm," said Dr. Miles. "The case is not all that we could wish it. Still we will hope for the best." "Is there danger, sir?" gasped Johnson. "Well, there is always danger, of course. It is not altogether a favourable case, but still it might be much worse. I have given her a draught. I saw as I passed that they have been doing a little building opposite to you. It's an improving quarter. The rents go higher and higher. You have a lease of your own little place, eh?" "Yes, sir, yes!" cried Johnson, whose ears were straining for every sound from above, and who felt none the less that it was very soothing that the doctor should be able to chat so easily at such a time. "That's to say no, sir, I am a yearly tenant." "Ah, I should get a lease if I were you. There's Marshall, the watchmaker, down the street. I attended his wife twice and saw him through the typhoid when they took up the drains in Prince Street. I assure you his landlord sprung his rent nearly forty a year and he had to pay or clear out." "Did his wife get through it, doctor?" "Oh yes, she did very well. Hullo! hullo!" It was March and the evenings were chill, so Jane had lit the fire, but the wind drove the smoke downwards and the air was full of its acrid taint. Johnson felt chilled to the bone, though rather by his apprehensions than by the weather. He crouched over the fire with his thin white hands held out to the blaze. At ten o'clock Jane brought in the joint of cold meat and laid his place for supper, but he could not bring himself to touch it. He drank a glass of the beer, however, and felt the better for it. The tension of his nerves seemed to have reacted upon his hearing, and he was able to follow the most trivial things in the room above. Once, when the beer was still heartening him, he nerved himself to creep on tiptoe up the stair and to listen to what was going on. The bedroom door was half an inch open, and through the slit he could catch a glimpse of the clean-shaven face of the doctor, looking wearier and more anxious than before. Then he rushed downstairs like a lunatic, and running to the door he tried to distract his thoughts by watching what; was going on in the street. The shops were all shut, and some rollicking boon companions came shouting along from the public-house. He stayed at the door until the stragglers had thinned down, and then came back to his seat by the fire. In his dim brain he was asking himself questions which had never intruded themselves before. Where was the justice of it? What had his sweet, innocent little wife done that she should be used so? Why was nature so cruel? He was frightened at his own thoughts, and yet wondered that they had never occurred to him before. As the early morning drew in, Johnson, sick at heart and shivering in every limb, sat with his great coat huddled round him, staring at the grey ashes and waiting hopelessly for some relief. His face was white and clammy, and his nerves had been numbed into a half conscious state by the long monotony of misery. But suddenly all his feelings leapt into keen life again as he heard the bedroom door open and the doctor's steps upon the stair. Robert Johnson was precise and unemotional in everyday life, but he almost shrieked now as he rushed forward to know if it were over. One glance at the stern, drawn face which met him showed that it was no pleasant news which had sent the doctor downstairs. His appearance had altered as much as Johnson's during the last few hours. His hair was on end, his face flushed, his forehead dotted with beads of perspiration. There was a peculiar fierceness in his eye, and about the lines of his mouth, a fighting look as befitted a man who for hours on end had been striving with the hungriest of foes for the most precious of prizes. But there was a sadness too, as though his grim opponent had been overmastering him. He sat down and leaned his head upon his hand like a man who is fagged out. "I thought it my duty to see you, Mr. Johnson, and to tell you that it is a very nasty case. Your wife's heart is not strong, and she has some symptoms which I do not like. What I wanted to say is that if you would like to have a second opinion I shall be very glad to meet anyone whom you might suggest." Johnson was so dazed by his want of sleep and the evil news that he could hardly grasp the doctor's meaning. The other, seeing him hesitate, thought that he was considering the expense. "Smith or Hawley would come for two guineas," said he. "But I think Pritchard of the City Road is the best man." "Oh, yes, bring the best man," cried Johnson. "Pritchard would want three guineas. He is a senior man, you see." "I'd give him all I have if he would pull her through. Shall I run for him?" "Yes. Go to my house first and ask for the green baize bag. The assistant will give it to you. Tell him I want the A. C. E. mixture. Her heart is too weak for chloroform. Then go for Pritchard and bring him back with you." For a moment he felt as if it were his wife's body that was lying there. But the run had freshened his wits and he saw that the mischief might be repaired. He pulled vigorously at the night-bell. "Well, what's the matter?" asked a gruff voice at his elbow. He started back and looked up at the windows, but there was no sign of life. He was approaching the bell again with the intention of pulling it, when a perfect roar burst from the wall. "I can't stand shivering here all night," cried the voice. "Say who you are and what you want or I shut the tube." "I want you to come with me to meet Dr. Miles at a confinement at once." "How far?" shrieked the irascible voice. "The New North Road, Hoxton." "My consultation fee is three guineas, payable at the time." "All right," shouted Johnson. "You are to bring a bottle of A. C. E. mixture with you." "All right! Wait a bit!" "Mind you take your cravat, John," and he impatiently growled something over his shoulder in reply. "We don't want to break a record," said he, pulling up and panting after attempting to keep up with Johnson for five minutes. "I would go quicker if I could, my dear sir, and I quite sympathise with your anxiety, but really I can't manage it." So Johnson, on fire with impatience, had to slow down until they reached the New North Road, when he ran ahead and had the door open for the doctor when he came. He heard the two meet outside the bed-room, and caught scraps of their conversation. "Sorry to knock you up—nasty case— decent people." Then it sank into a mumble and the door closed behind them. Johnson sat up in his chair now, listening keenly, for he knew that a crisis must be at hand. He heard the two doctors moving about, and was able to distinguish the step of Pritchard, which had a drag in it, from the clean, crisp sound of the other's footfall. There was silence for a few minutes and then a curious drunken, mumbling sing-song voice came quavering up, very unlike anything which be had heard hitherto. At the same time a sweetish, insidious scent, imperceptible perhaps to any nerves less strained than his, crept down the stairs and penetrated into the room. The voice dwindled into a mere drone and finally sank away into silence, and Johnson gave a long sigh of relief, for he knew that the drug had done its work and that, come what might, there should be no more pain for the sufferer. But soon the silence became even more trying to him than the cries had been. He had no clue now as to what was going on, and his mind swarmed with horrible possibilities. He rose and went to the bottom of the stairs again. He heard the clink of metal against metal, and the subdued murmur of the doctors' voices. Then he heard Mrs. Peyton say something, in a tone as of fear or expostulation, and again the doctors murmured together. For twenty minutes he stood there leaning against the wall, listening to the occasional rumbles of talk without being able to catch a word of it. And then of a sudden there rose out of the silence the strangest little piping cry, and Mrs. Peyton screamed out in her delight and the man ran into the parlour and flung himself down upon the horse-hair sofa, drumming his heels on it in his ecstasy. "Doing well," answered the doctor. "I'm sure, doctor, I'm very—I'm very—"he grew inarticulate. "Here are your three guineas, Dr. Pritchard. I wish they were three hundred." "So do I," said the senior man, and they laughed as they shook hands. "Looked nasty at one time." "Very glad to have your help." "Delighted, I'm sure. Won't you step round and have a cup of coffee?" "No, thanks. I'm expecting another case." "Can I come up?" he cried, and then, without waiting for an answer, he took the steps three at a time. Mrs. Peyton was standing by a soapy bath with a bundle in her hands. From under the curve of a brown shawl there looked out at him the strangest little red face with crumpled features, moist, loose lips, and eyelids which quivered like a rabbit's nostrils. The weak neck had let the head topple over, and it rested upon the shoulder. "Kiss it, Robert!" cried the grandmother. "Kiss your son!" "Thank God it is over! Lucy, dear, it was dreadful!" "But I'm so happy now. I never was so happy in my life." "You mustn't talk," said Mrs. Peyton. "But don't leave me," whispered his wife.